Cover– Love the new logo at the top. Our hero has the damsel in hand while trying to escape from a robot. It all looks good. Art– I really like the Kirby inspired art style of Erik Larsen. It has this fluidity during fight scenes which is second to none which is complimented by the expressiveness of his characters faces. The state of mind and emotion on their faces and their mannerisms are highlights on this book every time I get my hands on Savage Dragon. Characterization– Malcolm Dragon has a very distinctive personality. Sure he has super powers but he is also battling acceptance and life as an outsider. The meeting with the mob also seemingly shook him to his core since he’s still a kid despite his large body. Social dynamics and an assortment of other issues also impact our young hero. Growth– This issue shows just how far life can take two lives. In the flashback we get Alison babysitting Malcolm Dragon and his sister. In the present they are both grown up and at each other’s throats much the same way that we grow up and grow apart in real life. Humor– Malcolm Dragon ends up in the hospital once more and has his big Wang seen by yet another girl. It’s one of those recurring moments in this series that never gets old. The shyness of Malcolm, the virgin makes the awkwardness that ensues even funnier. Romance– The on again off again nature of Malcolm’s relationship with Maxine makes it very reminiscent of those early teenage musings and crushes we had in our youth. It takes me down memory lane! Balance– This issue manages to balance that tight rope of being too bloody without sacrificing the plot. Take note Danger Club this is how you stay on the right side of gore. Image Comics has always been more visceral than say Marvel or DC and this book balances it all in such a way that you can read this with your teen without too much awkwardness. Consequences– It was a nice touch to have the parents of the groupies who were killed back in Savage Dragon #194 show up to demand justice. It adds real consequence to this book not seen in pretty much anything put out by Marvel or DC right now. I’ve often wondered about the civilians during a battle with the Avengers but it hardly ever gets brought up. 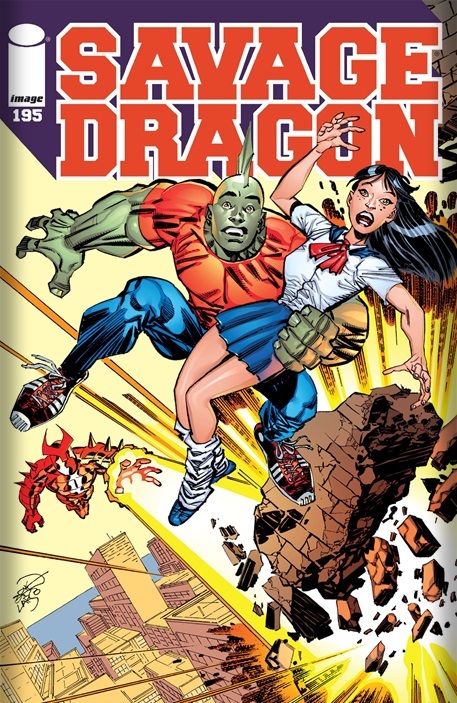 Savage Dragon on the other hand puts it front and center with cause, effect and ultimately consequence all being components of its characters lives. Malcolm may be on a slippery slope as he walks the same steps as his dad….and we all know where that landed ole daddy Dragon. 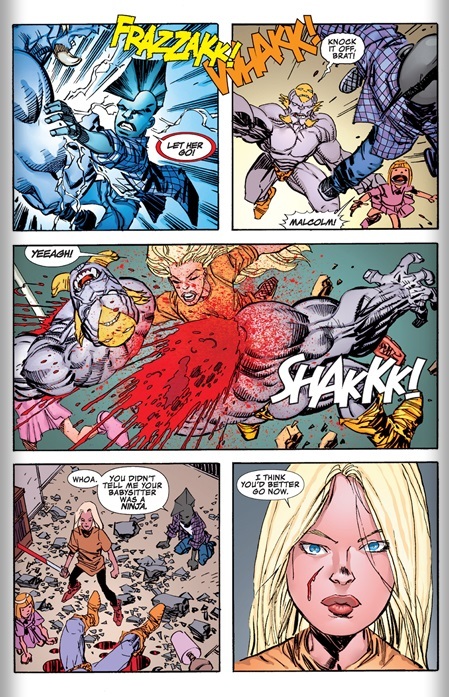 Art-If you’re not a fan of Erik Larsen’s art style this issue will not win you over. Profile– It’s tragic that a book this good doesn’t get more press. You and your comic shop are missing out big time.